This image was projected onto the side of Portland City Hall Friday night. 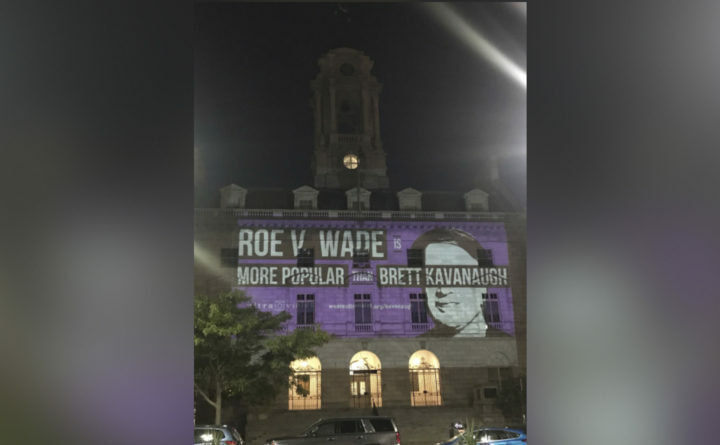 Although the city does not allow such projections onto City Hall without permission, Mayor Ethan Strimling, who supported the sentiment of the message, said he hopes the city won't pursue whoever is responsible. PORTLAND, Maine — Officials from the city of Portland say that a light display that covered the front of city hall on Friday night was not sanctioned by the city, but some city councilors say they approve of the message. City spokesperson Jessica Grondin says that they don’t allow projections of this kind on city hall without expressed permission. She says examples of that would be the Fourth of July light display. Despite Friday’s display being illegal, both Mayor Strimling and Councilor Ali stand by their approval of the message, saying that it’s a matter of free speech. “I think people have a right to express their opinion, and I certainly hope the city doesn’t take any action against them. This is their right to project a message on the side of the building that’s owned by the public,” Mayor Strimling said. “It’s not advocating harming other people, it’s a message they believe in, and that message is allowed to have room in our political and civic discussions. I don’t have a problem with that,” Councilor Ali said. CBS13 asked Mayor Strimling if it should be important for the city to differentiate when a displayed message is approved by the city or not, such as the city’s approved display of the Pride Flag during Pride Week. He says that Friday’s incident is a completely separate issue, and that the city isn’t responsible for the opinions of a citizen. “This was a private entity wanting to project their message, that’s a different issue. Just like you could walk on the sidewalk now and express what you feel, and you should be able to do the same,” Strimling said. Grondin says that the city doesn’t know who was behind the project, and that they don’t expect any legal action to come from it due to how hard it is to enforce.